Chapman, Dale Melvin - Age 72, of Cadillac, formerly of Flushing, died March 30, 2019. Private family services are being held. Arrangements are being handled by Sharp Funeral Home and Cremation Center, 6063 Fenton Road, Flint. Those desiring may make contributions to Hospice of Michigan www.hom.org/donations/ please select region to benefit "Cadillac" or by phone 1-800-669-9335. Dale was born July 23, 1946. Dale graduated from Flushing High School in 1964 and retired from Chevrolet in 1999. He loved dirt bikes, motor cycles, classic cars and everything with a motor. He could fix or build just about anything and used his many talents to help his family and friends with countless "projects" which brought him great joy. He especially loved when he enlisted the help of his kids, grandkids, and buddies as he loved to pass his knowledge on. 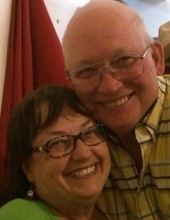 His favorite partner was his best friend and wife of 25 years Sallie.Together they embarked on many adventures on their Goldwing, in their camper, and taking on many "projects" making beautiful homes together. They enjoyed a wonderful life rich in friendship, family and love. Dale will be terribly missed by his wife Sallie; sister Charlotte; children, Kelly, Koreen and John, Amie and Mike, and grandchildren, Joseph, Max, Arial, Elvis, Jackson, Vardan, Sallie, Ryan and Zevon. Tributes may be shared at the obituaries page at www.sharpfuneralhomes.com. To send flowers or a remembrance gift to the family of Dale Melvin Chapman, please visit our Tribute Store. "Email Address" would like to share the life celebration of Dale Melvin Chapman. Click on the "link" to go to share a favorite memory or leave a condolence message for the family.